Military workers received civil-defense training from Royal Thai Navy instructors in Sattahip before being appointed to new civil servant jobs in Thailand. Capt. 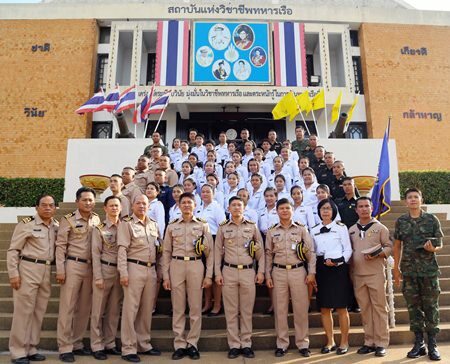 Wirat Somjit opened the training session at the Chumphon Navy School Feb. 13 that will give civil servants a rank lower than a commissioned military officer, but with more skills to work on behalf of the public. Military workers and Royal Thai Navy instructors gather for a class photo after civil-defense training in Sattahip. Wirat said that the Civil Defense Officials Curriculum is an essential course for government officers before being assigned jobs. Students are trained to have the spirit of military professionals and qualifications before being able to be appointed to become commissioned officers. Hopefully, all students would intend to complete the training resulting in success and achievement of the government objective.